New York, NY – Greenpeace USA joined Our Power Puerto Rico Campaign this week to announce a brigade traveling to Puerto Rico to deliver much needed resilient aid. The announcement was made at the historic Arctic Sunrise ship docked in Brooklyn with members of UPROSE, Climate Justice Alliance, Greenpeace USA, and other allies from across the US part of the #Justrecovery campaign #Our Power Puerto Rico launched last week. The brigade plans to deliver resilient and sustainable resources onto the Island for a just recovery that can help protect Puerto Rico from the kind of destruction left by hurricane Maria. Items include bikes, solar panels, water filters and more. 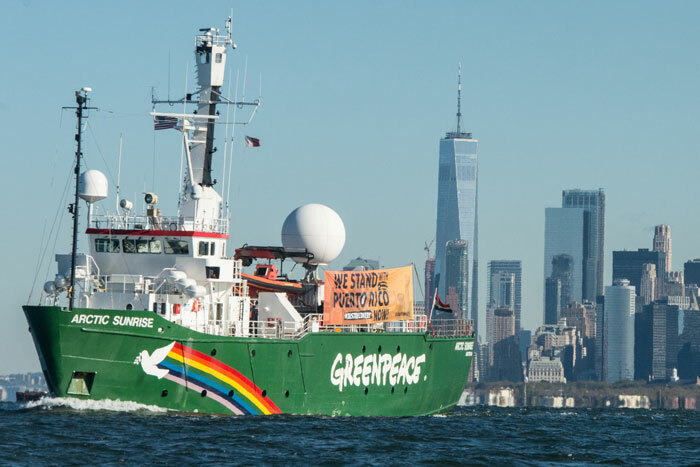 Greenpeace’s historic Arctic Sunrise ship arrived in New York City over the weekend, kicking off a month-long tour along the Atlantic Coast highlighting threats to the oceans and climate and impacts to our communities. The tour will support #OurPowerPR campaign, an effort led by allies in the climate justice movement to deliver critical rebuilding supplies and expertise to rural communities in Puerto Rico following Hurricane Maria’s devastating impacts to the region. The organizations involved in the effort include: Climate Justice Alliance (CJA), UPROSE, Organización Boricua, Greenpeace, It Takes Roots (Indigenous Environmental Network, Right To The City, Grassroots Global Justice Alliance, Climate Justice Alliance), WhyHunger, USFSA, Grassroots International, The Ruckus Society, Just Transition Alliance, Movement Generation, Solutions Project, The LEAP, with the support of Wallace Global Fund, The Center for Earth, Energy and Democracy (CEED), Solutions Project, Solidaire Just Fund Portal, Rose Foundation, Underdog Fund and others. ***On Tuesday Greenpeace Arctic Sunrise held a banner display in support of Puerto Rico before traveling to Norfolk, VA, Wilmington, NC, and Miami, FL, educating the public about the impacts of plastics and oil drilling on our coasts and to raise awareness of the limitations imposed by the shipping restrictions of the Jones Act to deliver relief aid. Greenpeace’s Arctic Sunrise is available to ship humanitarian help but can’t because the Jones Act waiver expired, Greenpeace will have to pay for additional charter boats to transport the aid. The tour will conclude with the delivery of materials to Puerto Rico, including solar systems, sustainable agricultural goods, and tools. “I want to thank our partners, the Climate Justice Alliance and Greenpeace for making this vessel available. We had hoped to load this vessel provided by Greenpeace with what the people of Puerto Rico had asked us for: soil, seeds, solar lanterns and bicycles that would make it possible for them to navigate their way through the island. Sadly, we can’t use this vessel because the Jones Act has shackled our ability to help. The federal government does not want to help Puerto Rico and does not want to make it possible for others to do so either. This is why this campaign, #OurPowerPR is demanding a repeal of the Jones act, demanding the debt be lifted and a path to a just recovery and Regeneration be forged by Puerto Ricans for Puerto Ricans,” said Elizabeth Yeampierre, Executive Director of UPROSE and Steering Committee Co-Chair of Climate Justice Alliance (CJA). “It is all hands on deck for Puerto Rico, Climate Change is real and it is being felt by climate justice communities like Organización Boricuá who have lost all their crops to the storms on the Island. They have yet to have clean water or food reach their rural areas. The state is of dire need and yet they are putting forth solutions for a regenerative economy, a new clean energy system, and a renewed commitment to food sovereignty on the Island. Congress should be pay heed to a recovery package that includes resilience for communities to prevent and better buffer the negative effects of climate on vulnerable people,” said Angela Adrar, Executive Director, Climate Justice Alliance.